“The Basques of northern Spain have contributed many superb dishes to our regional tropical cuisine. 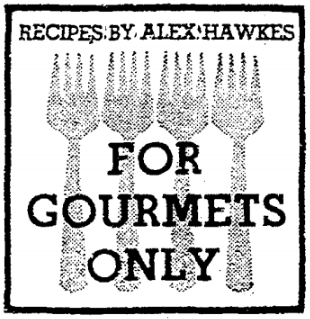 Alex D. Hawkes was an epicure of the times, having written for Gourmet food magazine in the 1960s. His career prior to becoming one of America’s foremost horticulturally inclined cooks, was Botanizing. Alex could be found trekking through our world’s lost jungles, scouring lush forrest canopies in the Caribbean and beyond, for rare plants, orchids, bromeliads, ferns, and palms. If it was green, Alex was keen to take notice of not just the plant’s botanical tidbits, but of their origin, history and quite often their culinary potential. Alex Hawkes was known for collecting recipes, and his receipt collection from the 1940s – 1970s would have been much different than internet bookmarks. Then, it was normal fashion to clip and collect newspaper clippings of the food section and hand written receipts, usually instructions from a relative, friend, if lucky the Chef of a local restaurant, or in Hawkes case, during one of his botanizing trips. Perhaps he sat in a Cuban cafe and noted one of their specialties in the 1940s, after indulging in Cayo Coco’s landscape? Flying beautiful white ghost orchids, Dendrophylax varius, as the Atlantic Ocean pounded the luscious Cuban archipelago. Another recipe after exploring a tropical rainforest in Brazil or South America? Indeed, Alex surely enjoyed these adventures with the famed ghost orchid, one of Florida Everglades’ extirpated orchids, and here it is seen calmly flowering in Cuba, as if nothing ever happened. Perhaps Alex’s Basque Eggs recipe was scoured from a Woman’s Club Cookbook, a local Junior League, or a Jamaican housewives society? Presumably, all of the above. We know his affinity for adapting recipes, from newspaper column hints Alex would leave us in his Floridian themed food columns (Florida Cookery, Sub-Tropic Cookery), for the Miami News, the Miami Herald, St. Petersburg Times, Lakeland Ledger, Jamaica Gleaner, and in his elusive self published subscription / mimeographed culinary musings COOKERY NOTES. We know that he collected thousands of recipes and how much he enjoyed reading, reviewing and recommending cookbooks, either by adapting their recipes for his Coconut Grove kitchen, or by citing an author and offering cherry picked recipes to the Floridian readers of his American food column. All this eclectic culinary diversity in an era prior to James Beard Foundation food writing awards, the namesake, a champion in the food writing field, whose column “Beard on Food”, would appear on occasion alongside Alex’s “Sub-Tropic Cookery” since James Beard’s recipes and musings for the Associated Press (AP), would be printed by hundreds of papers across the states. Alex wrote in a time that only the noble could relish in, having his recipes printed next to Beard’s, the dean of American cooking, is enough to raise our hands and acknowledge Alex as one of the gourmands doing their part to introduce us to cuisines from lands far, far away, but as close as a succulent bite. Alex would have been a James Beard writing award winner. His wise approach was warm, and where else would he have been a better fit than Miami’s enchanting Coconut Grove neighborhood? Today we are off to Spain, one of Europe’s most delicious countries, and home of the world’s oldest restaurant, Botin Restaurant in Madrid serving dishes since 1725. Perhaps Craig Claiborne and Alex Hawkes chatted about Spain’s Botin when they spoke on the phone? Well, for this egg recipe we are sharing with you today, the source is yet known, and after perusing the pages of our Gasparilla Cookbook, we can assure you that Alex didn’t adapt this recipe from the Gasparilla ladies. The source of the cited column from 1965, “Omelet Is Now Happy” (St. Petersburg Times), will be shared in a subsequent post. For now enjoy these superb Basque Eggs as published by the Miami Herald in the 1960s. Slice the potatoes less than one-quarter inch thick, and in a large skillet saute them in the butter with the onions, until they are browned. Add salt and pepper during this cooking process. Pour the beaten eggs over the potatoes and onions, and sprinkle with the chopped scallions and minced parsley. Lower heat, cover, and cook until the eggs have – set about ten minutes. Serve at once to for persons. What is Sub-Tropic Cookery? 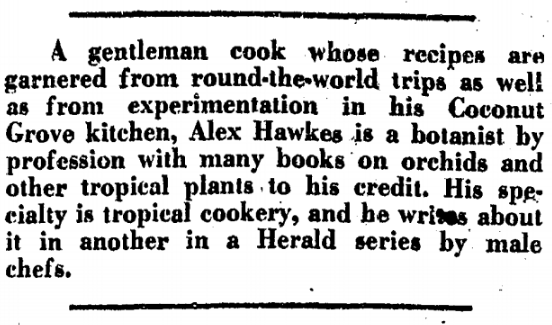 Who was botanist & cookbook author Alex D. Hawkes, from Coconut Grove? Exploring the fruit and vegetable kingdom with the late botanist, and cookbook author Alex D. Hawkes (1927-1977). Recipes, botany and lore of the fruit and vegetable kingdom. Welcome to Alex’s garden & kitchen… palm and bromeliad expert, orchidologist Alex D. Hawkes shared a lot with us, especially through the recipes he collected, from his world travels as a botanist. We “RecipesLost” hope you get to try some of Alex’s recipes, let us know, try it out, take a chance, have a taste will ya? Alex D. Hawkes graduated from the University of Miami in the late 1940s as a Botanist. Among his first assignments for Fairchild Tropical Botanic Garden (FTBG), in Coral Gables, was documenting the Palms all over the globe. Alex compiled this breathtaking task in a 9 volume work in the early 1950s after traveling the world, while enjoying it quite thoroughly, for the botanical garden. Alex also gathered some papaya “pawpaw” recipes, that will be posted, from his stay at Dr. David Fairchild’s “Kampong” in the Magic City’s Coconut Grove neighborhood. Hawkes was keen enough to collect recipes everywhere he went. His vast recipe file, wherever it may be, will reveal a treasure of recipes. To the person guarding it, thank you. The recipes Alex collected, whether if it was from a hotel he stayed at in Nicaragua during one of his botanical adventures discovering colorful orchids, or from the mountains of Peru and Mexico, were wholesome and honest. The caribbean captivated Alex, it’s influence is shown through Alex’s grasp of the many cuisines that make up the West Indies. The caribbean is the home of many beautiful places, but Alex lived only in two, Cuba & where he passed away, Jamaica, his second home away from beautiful Coconut Grove, FL. in Miami. An adventurer, botanist, cook, writer, columnist & more, Alex D. Hawkes left us recipes, to enjoy cultural experiences, and a taste of the past, which is still as delicious as it once was. He traveled the world, Europe, South America, Latin America, India, Japan, & beyond. Alex played an integral role in South Florida’s bustling botanical circles. He mimeographed and published several independent papers that are now considered collector’s items, on various subjects. Orchids, Bromeliads, Palms and his culinary writing, the elusive, “COOKERY NOTES”. Alex was the coordinator of The Bromeliad Society of South Florida, Inc., serving as temporary Chairman of the Board. Alex was known for hosting high tea in his Coconut Grove backyard garden. These occasions must have certainly called for lovely Floridian menus. Alex’s notoriety allowed him to maintain a constant flow of correspondence with his colleagues and readers. If you have found any of Alex’s letters, please contact us. Alex’s recipes have been shared and adapted in newspapers by food columnists & cookbook authors in their works. Alex had many friends and shared his mimeographed COOKERY NOTES with countless of acquaintances and food professionals of the era. Authors such as Elizabeth Alston, Nika Hazelton, Elisabeth Lambert Ortiz, Elizabeth Schneider, Bernard Clayton Jr., Cecily Brownstone, Jane Brody, Ruth Gray, Bertha Cochran Hahn & Jane Nickerson have cited Alex or exchanged letters with him. There are more, we hope, do let us know if you find one folded up inside a cookbook while you peruse it. Contact Us -> #RecipesLost In the late 1960s Mr. Hawkes humbly had lunch with Julia Child and James A. Beard at Joyce Chen’s restaurant in Cambridge, Massachusetts. He was covered by Craig Claiborne in the New York Times (1960s), and Alex’s cookbooks were mentioned thereafter by Claiborne. Gourmet the Magazine of Good Living, was at the time the premier magazine for food talk. The magazine featured many seminal figures that helped shape the way America eats. Among the many writers to mention, Gourmet would showcase columns by Mary Frances Kennedy Fisher (M.F.K. Fisher), and her occasional wine musings. It was not odd for these pieces to appear alongside writings on an endless variety of culinary ‘Delights And Prejudices‘, by none other than the Dean of American cookery, James A. Beard. 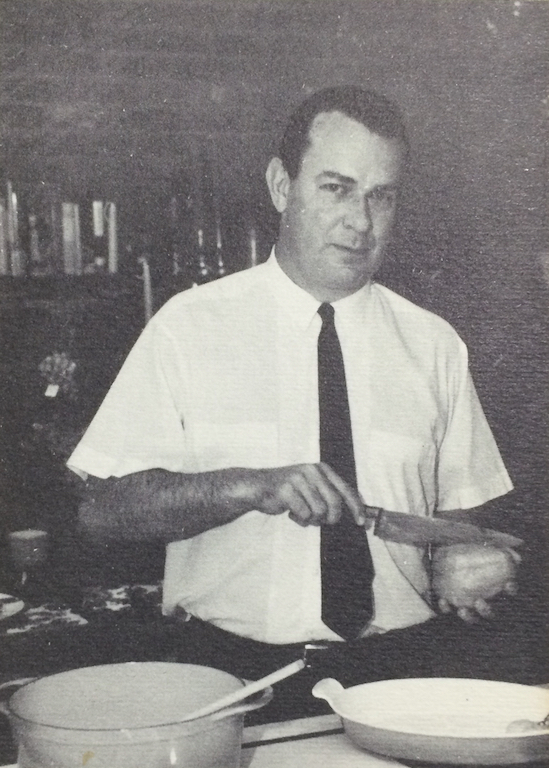 In the October (1964) issue of Gourmet, Alex D. Hawkes joined the ranks of several of the cookbook authors he esteemed. With his first cookbook ‘South Florida Cookery‘ (1964) hot off the presses, Alex’s food writing career couldn’t have begged for a brighter red carpet. Alex’s piece for Gourmet featuring the squash like Chayote, ‘Sechium edule’, Cucurbitaceae, was as exciting to read, as it was to prepare. The recipes Alex discovered in Mexico & Nicaragua, during his botanical adventures, are culinary time capsules. After being introduced how to prepare chayotes in quite culturally distinct fashions, Alex returned to his Coconut Grove kitchen with the recipes, and shared them with the world. Chayote recipes will be featured in a later post, stay tuned. Alex continued sharing his recipes, which landed him a food columnist gig for The Miami Herald, after he won a Cook of the Month title in 1963. Alex continued onto the Miami News in the mid 1960s. 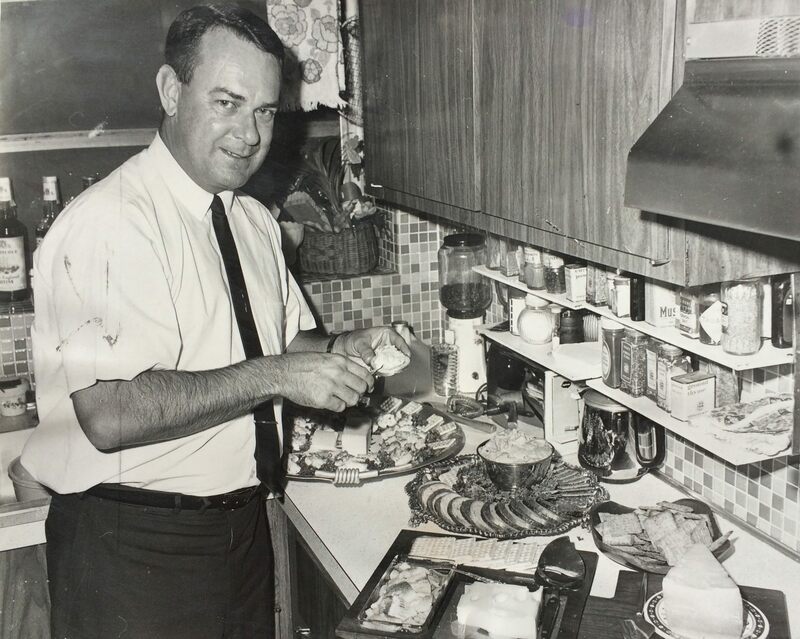 Then, via his horticultural society connections, he penned a food writing column in North Florida, for the St. Petersburg Times in the late 1960s, via his column ‘Florida Cookery’, seldomly ‘Southern Cookery’. By the 1970s Alex was dividing his time between Jamaica, and Coconut Grove. In the Caribbean, he was maintaining a daily radio program ‘What’s Cooking’ on Radio Jamaica, cooking TV appearances, & varied columns for The Jamaica Gleaner, on topics such as sightseeing, horticulture, botany, & of course recipes. Never forgetting his Floridian roots, Alex, simultaneously maintained his ‘Sub-Tropic Cookery’ for The Lakeland Ledger, in central Florida. Jane Nickerson, ex Food Editor of the New York Times, moved to Lakeland, and took on the role of food editor at The Ledger. ‘Sub-Tropic Cookery’ by Alex Hawkes, was an excellent column for Jane Nickerson to have in her food section, since the cuisine in Florida was being shaped quite differently than the rest of the United States of America. This is due in part to the rather recent availability of imported varieties of lesser known rare fruits & vegetables in markets across the U.S.A.. The state’s markets were being influenced by the various cultures, that were all then, calling “The Sunshine State” their new home. The United States has always been regional, The Great West, The North West, The Eastern Heartland, New England, Creole & Acadian, Southern Style & Florida somehow gets left out of the South. Although not part of the Caribbean, it’s the only subtropic state in North America. Alex Hawkes took full advantage of the knowledge he picked up during his world travels, and assisted Americans with the bountiful heaps of tropical fruits and vegetables that were to be found in their markets. The United States is perhaps the first country to seek out cuisines from all corners of the globe and make it possible via cookbooks, supermarkets and strong agricultural networks. Alex was interested not just in bringing the recipes home, but also sparking curiosity about how something grew or where it originated. He was able to highlight a vegetable, whether it was misunderstood, or avoided and create something unique yet simple. Alex authored hundreds of articles & botanical books. For a list of his cookbooks follow this link -> Alex D. Hawkes – Botanical Works & Cookbooks. ‘Sub-Tropic Cookery‘ is maintained by the Recipe Hunters @ #RecipesLost. A food history & recipe scavenging project. Share with us via the tag #RecipesLost or send us your recipe request. Have a question or request of what do make or what to do with a fruit or vegetable? Looking for an interesting side dish? Send us an email at RecipesLost@gmail.com ~ Oh yeah! If you have any copies of Alex’s COOKERY NOTES please let us know! Thank you. Image: Cookery Notes – November 1967 – Vol. 4, No. 1 – Fondues For Everybody! – We would like to thank Mr. John Banta who provided us with a few Volumes of Alex Hakwes’ COOKERY NOTES. If you find any pages, please let us know, thank you! Chicken Coconut Grove: Chicken à la King Baked Inside Coconuts! With such scenic and historical locations such as The Barnacle Historic State Park, inhabited by one of the first residents of what was then called the “Scrububs”, Kirk “Commodore” Munroe, and his wife Mary Barr. Another gem still available for the public’s enjoyment is Dr. David Fairchild’s “Kampong”, built by the Dr. and his wife Marian Hubbard Bell, daughter of Alexander Graham Bell and Mabel Gardiner Hubbard. Nestled in Coconut Grove you’ll find the breathtaking “Kampong” adorned by mother nature herself, a lush botanical paradise sitting against Miami’s Biscayne Bay. When Graham Bell stayed at “The Kampong” he insisted on not having a telephone installed in the cottage he lodged at. Peculiar, noting that Graham Bell is noted as one of the inventors of the telephone. When visiting Miami and Coconut Grove, this botanical oasis is not to be missed, when in “Grovite” Alex’s hometown. Although the Coconut Grove neighborhood is currently undergoing harsh renovations, as it has been for quite some time, let us revel in this dish and the history that surrounds this recipe and Alex’s inclination to name this creation as he did. While houses can be torn down, this recipe should never be put to rest. 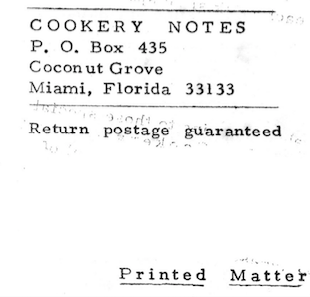 The recipe for Chicken Coconut Grove was fittingly devised in Alex’s Coconut Grove kitchen. It’s unique not solely because the name of the dish matches the town, but also because, botanist Alex D. Hawkes was a renowned palm expert. Alex’s shares with us in his first cookbook, ‘South Florida Cookery‘ (1964) that it is not known where the Coconut, one of the best-known of all palms, is native. The ‘Cocos nucifera’ means “nut bearing”, and as Alex shares this is certainly appropriate. Perhaps botanists have already figured out where it is indigenous? If not Alex and his more learned colleagues were certainly going nuts over coconuts for a good reason. Alex also shared that South Florida is the only place in the Continental United States where Coconuts can be grown outside without protection. As is such, let us enjoy this delicious Chicken Coconut Grove out of coconut shells. Seek out coconut wherever you may be and partake of this quite ingenious culinary creation ‘Chicken Coconut Grove’. Reminiscing on supermarket staples of the 1950s & 1960s, Chicken à la King has an interesting story. Rather than using a modern day canned equivalent or a Chicken à la frozen food section, we sought out direction from The Dean of American cooking, someone whom Alex D. Hawkes was very familiar with, James A. Beard. In James Beard’s American Cookery (1972) [Little, Brown & Company] there’s a wonderful recipe for this dish. Thanks to google we can retrieve a preview of that recipe from Beard’s book at the link below. In the article linked below, another one of Alex’s pen-pals, Craig Claiborne shares a nibbling about Chicken à la King, along with a recipe that he originally shared via his food column in a 1980s edition of the ‘The New York Times’. The article linked below was written by Leah Koenig. Notice Hawkes & Beard both call for Sherry (Chinese Shaoxing rice wine), may also be used. The wine should be added during the sauté if used. The coconut water, is added before the sawed coconut shells are put into the oven. Choose whichever recipe you like best and cook over the stove until it is about 50% done. Then, transfer the mixture into the coconut shells as Alex instructs, and finish cooking the dish in the oven. It is recommended to use a thermometer and adjust times as needed for your oven. Use best judgment and exercise caution when cutting the coconut shells with a saw, and during cooking. Use a drill to puncture the “eyes” of the coconuts. Enjoy!